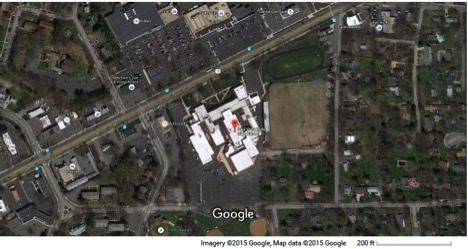 The Roman Catholic Diocese of Arlington (diocese) decided to relocate Paul VI High School from its current location on Fairfax Boulevard to South Riding, Loudon County. They currently plan to vacate the school after graduation in 2019. They plan to sell the school site and two adjacent residential lots on Cedar Avenue (total 18½ acres) for private use. Meanwhile, in a separate proposal, the Avalon Bay Company has proposed to redevelop the area just west of Paul VI at the Breezeway Motel and several adjacent properties. Aerial view of Paul VI campus, courtesy of googlemaps. The diocese recently hired IDI Group to act as the Master Developer. IDI will develop plans for the site and see the plans through necessary rezoning and special use permits. They may purchase some or all of the site and see it through development, but they do not currently own the site. IDI Group will be working with StreetSense, the research group that studied the Fairfax Boulevard retail potential for Fairfax City in 2013. The diocese would like the redevelopment of the site to align with its mission-oriented goals and anticipates that affordable senior housing will be an element of the plan. In a recent meeting with Fairfax City Citizens for Smarter Growth, IDI’s Enrico Cecchi explained that the goals for the site are mixed use, with a mix of residential types, retail, and public open space. The project will be consistent with the Comprehensive Plan for Fairfax Boulevard. They expect the residential density to be 20 to less than 40 units/acre. Important features are pedestrian connectivity, and transition to existing single family homes along McLean and Cedar. Cecchi also mentioned that the diocese is interested in mission uses such as affordable and senior living uses. Because of the building location and age, they expect to demolish the existing school and other buildings on the site. Recognizing the historic significance of the school, they plan to preserve something of the look of the school in the new project. They also will demolish the John C. Wood house and plan some feature to recognize his contributions to the city. There are also opportunities to further extend the area for redevelopment, through acquisition of lots currently on the market or other means. The entrance to the project will be from the existing stop light across from the school. IDI does not currently plan to connect the sections of Cedar Avenue for motorized traffic. IDI has already met with the mayor and each council member. They will also be meeting with the American Legion, HFCI, and Historic Fairfax Neighborhood Association. They expect to have public meetings in January, and to have a preliminary plan in the spring. Near Paul VI, Avalon Bay Companies has proposed a redevelopment of the Breezeway Motel site and adjacent properties to the south and east extending to near Chilcott Field. The City Council was recently briefed on the proposal. The staff report on the proposal can be found at the City’s October 6 meeting agenda. Fairfax City Citizens for Smarter Growth has several concerns with the Avalon Bay proposal. With planning beginning to get underway in earnest about the future uses of the Paul VI property, we believe the City needs to take a very deliberate approach to redevelopment of the Breezeway and adjacent lots. We as a community have an opportunity to look at redevelopment more comprehensively through integrating all of these sites that are now in play. 1) Effect on the walkable street grid: The Master Plan recommends creating a more compact street grid with walkable blocks. In addition, with discussions about the future use of the Paul VI property, there may be opportunities to align Oak Street with Meredith and connect the two segments of Cedar Avenue across the current Paul VI parking lot, in order to extend the street grid. By massing a large apartment building over the current Cedar Street, the proposal would curtail this opportunity. In addition, the proposal would create a much longer block size. When blocks are more than 400 feet long, they greatly discourage walking and pedestrian-friendly community design. 2) Lack of retail: The current proposal has no stores or businesses, only housing. It should include retail uses, especially on the ground floor of the buildings facing Fairfax Boulevard. This would help enliven Fairfax Boulevard and improve the retail environment for nearby residents, including not only the residents of this potential redevelopment but also those of existing neighborhoods. 3) Inappropriate scale and massing: The proposed buildings are vastly out of scale with the existing neighborhood to the south. The buildings seem introverted, without any clear relationship to the existing neighborhood. Such a proposal could result essentially in two different neighborhoods, rather than integrating within the existing neighborhood and strengthening community bonds. Why would re-connecting Cedar Ave. be good for those families that live in the neighborhood behind PVI and east towards Chain Bridge Road? Daniel, Very sorry for the tardy response. Connecting Cedar Avenue could work for everyone including residents of the adjacent neighborhoods if the connection includes traffic calming measures to deter cut-through traffic. There are ways to do this that would deter through-traffic from using Cedar to get to 123. Bulb-outs could force motorists to go at lower speeds and make using Cedar more conducive to local trips rather than as an alternative to 50. The Kamp Washington Novus Fairfax project will include a new internal street between 50 and 29 just across from Bevan Drive that has traffic calming measures to deter drivers from using Bevan as a cut-through. Something similar may be able to be worked out for Cedar Drive. Bottom line, there is already excessive cut through traffic on Cedar, conducted by motorists looking to avoid traffic on Fairfax Blvd or Main St., both during morning and evening rush hours. Reconnecting Cedar would only make the problem worse. The breezeway project (as I understand it) will eliminate Cedar Ave between Walnut and Oak. The immediate effect of which will likely be additional east-west traffic on both 2nd and 1st Streets. These are residential streets with no sidewalks that already see an inordinate amount of cut through traffic. This (negative effect) on the already less than ideal walk-ability of these streets should be accounted for in the planning of this project. Scott, Thanks for your comment and apologies for the late response. Our group has the same concern, which is reflected in the comments on the project that we submitted to the City recently.